Prof. Yushan Duan, Dr. Marie Price, and Dr. Robert Chen flanked by Chinese geography students. This large event brought together more than 150 geography students and teachers from across China and was organized by Prof. Xioashi Xing and Prof. Yushan Duan of the Center for International Earth Science Information Network (CIESIN) and the China Committee of the International Geographical Union’s Commission on Geographic Education (IGU-CGE), respectively. The IGU-CGE is led by the faculty of China’s 16 leading geographic programs. The seminar was truly an excellent opportunity for top American and Chinese geographic leaders to come together and discuss the future of geographic education. The globe that Dr. Price gave to Prof. Duan. China structures its geographic education quite differently than the U.S. does. Firstly, geography is a required high school subject in China; all high schoolers must learn the basics of human and physical geography before they move on to the university level. 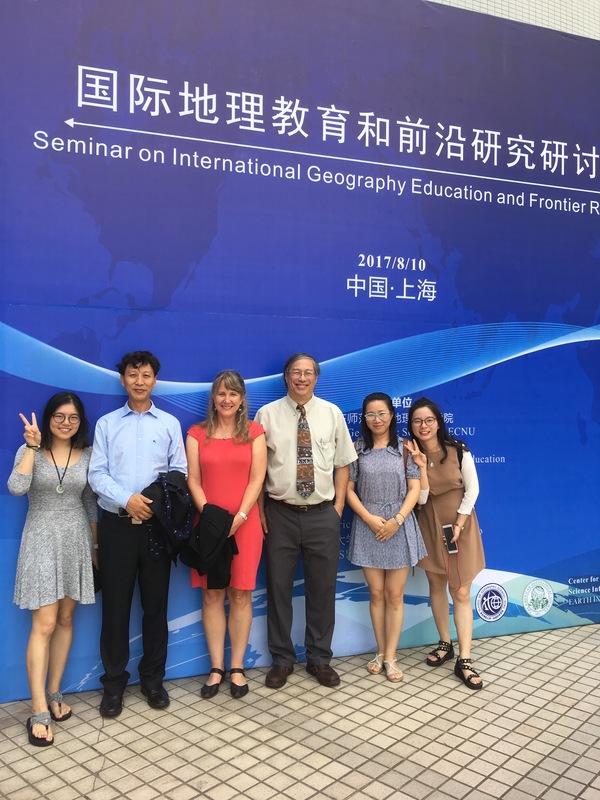 While geography is encouraged as an AP course in the U.S., the enrollments in these classes are not at the scale of Chinese secondary instruction. In the U.S. there were over 200,000 students who took the AP Human Geography exam, whereas in China, there are more than 300,000 geography teachers and millions of students. Chinese educators were interested in learning more about the American curriculum and how the subject is taught in the U.S. The entire 3-day event was highlighted by the exchanging of gifts between Marie Price and Yushan Duan. 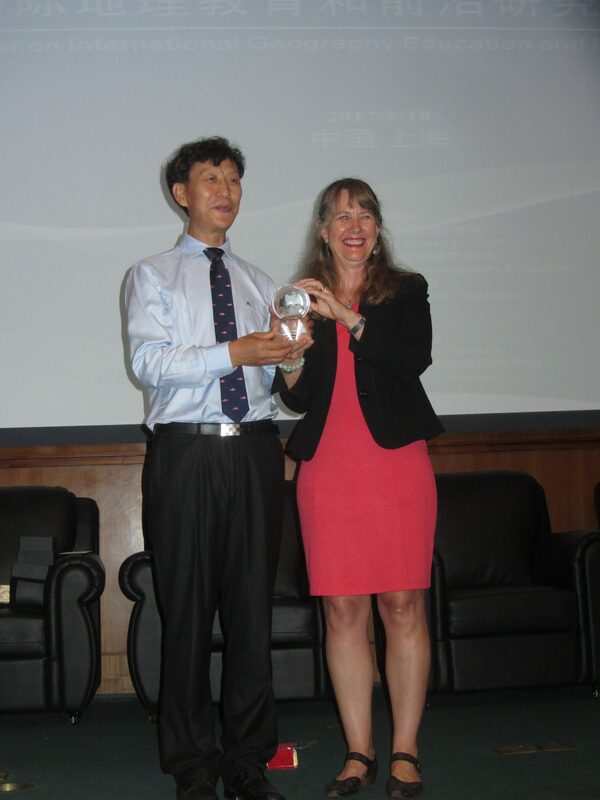 AGS was proud to gift Yushan and all those who helped host the event a crystal globe engraved with the seal of AGS and a message of friendship and collaboration to ECNU. 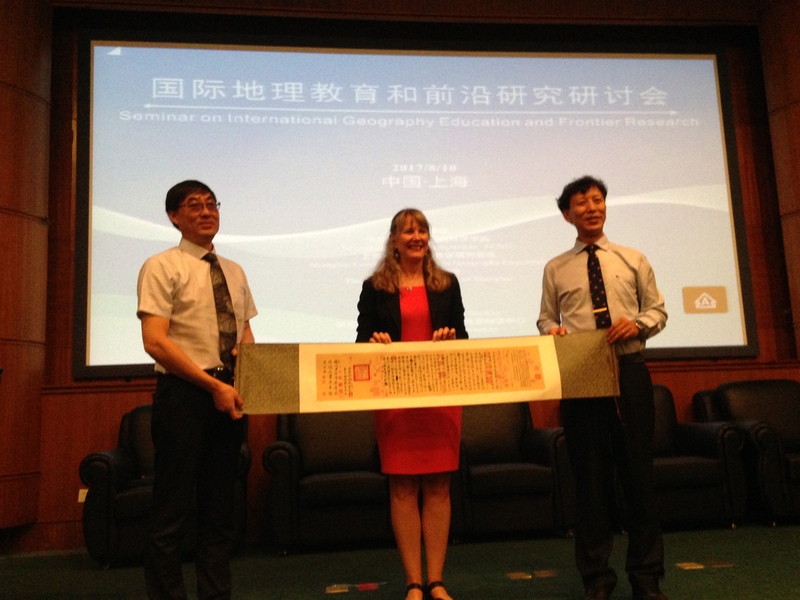 Dr. Price said it represents the strengthened friendship between the American and Chinese geographers. In return, Prof. Duan gave Dr. Price and AGS a traditional scroll and fan to commemorate the occasion. The scroll presented to Dr. Price. At this seminar, each of AGS’s representatives gave talks and lectures, and each related back to geographic education in the U.S. Marie Price talked about global immigration trends and world regional geographic education in the U.S., whereas Alexander Murphy focused on human geography and the status of geographic research in the U.S. Councilor Robert Chen had the opportunity to represent not only AGS but CIESIN, which he is the director of, and presented two lectures in Shanghai about topics ranging from sustainable urban development and infrastructure to global mapping of human settlements and population distribution. AGS was very pleased that Liliana Monk, from the 2016 group of AGS Geography Teacher Fellows, lectured on the state of the U.S. AP Human Geography Program.